FairLifts arranges aerial mining assistance throughout the state of Montana. 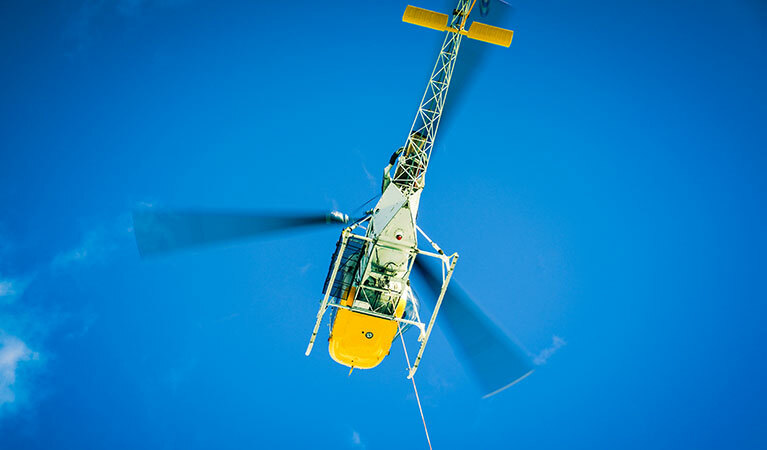 Being connected to a vast network of helicopter pilots and crews help when bringing you the quality helicopter services you need for your mining operations. Services FairLifts can coordinate include the transportation of your team, mine mapping and exploration, drilling and rig support, and rehabilitation/reseeding efforts. Because of a helicopter’s ability to hover, lift heavy objects, and fly in a precise manner effortlessly, it is the perfect companion for any mining operation in Montana. FairLifts helps you receive the helicopter services you need. Montana has been a popular place to mine, and its mining history is rich and vast. A variety of substances have been mined in Montana, including silver, gold, copper, lead, zinc, coal, and manganese. It all started in 1864 when the Gold Rush had taken over, and gold was discovered in Silver Bow Creek. After gold mining died down, copper became a major asset in Butte, Montana. The town prospered, and from 1880 to the 1990s, it produced 20.8 billion pounds of copper, 4.9 billion pounds of zinc, 3.7 billion pounds of manganese, 855 million pounds of lead, 709 million ounces of silver, and 3 million ounces of gold. FairLifts sets up helicopter services, providing aerial mining assistance throughout the entire state of Montana. Often times a helicopter can get a job done faster and safer, alleviating the burden from the ground crew. Because of these advantages, a helicopter poses a great asset in mining operations. Helicopter mining operation assistance comes in a variety of forms. A few of the tasks FairLifts can arrange in the spectrum of aerial mining assistance include: drilling and rig support, transporting crew members, mineral exploration and mapping, and mining rehabilitation and reseeding. A helicopter’s heavy lifting ability makes it the perfect machine to assist with mining and rig support. A helicopter can hover, meaning it not only can lift a heavy object but hold it in place for an extended period of time, taking the burden from a ground crew. Mapping out a mine can prove to be time-consuming. An exploration helicopter can cut this time down by quickly mapping out a mine faster than any ground crew ever could. You can save on time and manpower by implementing a helicopter for mining exploration and mapping. If you are looking to rehabilitate the land or reseed land where mining took place, a helicopter can help in these tasks. Reseeding land can get done in no time with aerial support. The environmental implications of reseeding and rehabilitating land can go along way when a helicopter is involved. Transporting personnel on the ground can prove to be a challenge. Often time it may take a while, especially if you are dealing with less than favorable terrain or are operating in a difficult to reach location. A helicopter solves these problems by providing precise transportation in a timely manner. No matter what task or tasks you need done in the realm of mining assistance, give FairLifts a call. We have team members eagerly standing by ready to answer your questions and provide you with a complimentary quote on helicopter mining services. Our lines are open 24/7 to accommodate your needs. Helicopter services offer the flexibility you need, and FairLifts arranges only the best helicopter services. Do not hesitate to reach out to us today. We are only one phone call away.